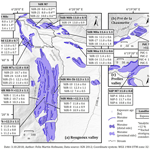 Hofmann, F. M.: Glacial history of the upper Drac Blanc catchment (Écrins massif, French Alps), E&G Quaternary Sci. J., 67, 37–40, https://doi.org/10.5194/egqsj-67-37-2018, 2018. Numerous studies dealing with Late Glacial and early Holocene glacier variability have been carried out in the Austrian and Swiss Alps. The advent of cosmic ray exposure (CRE) dating, based on the concentration of in situ produced cosmogenic nuclides in the quartz fraction of boulders on moraines, has, since then, enabled the chronology of glacier fluctuations in these regions during this period to be refined (see references in Ivy-Ochs, 2015). However, this holds partly true for the French (Western) Alps. The few available CRE ages from boulders on moraines in this region (e.g. Chenet et al., 2016) indicate glacier fluctuations concomitant with the cooling at 12.7kab2k (kiloyears before ∼2000CE; Heiri et al., 2014). Further glacier fluctuations in the French Alps occurred until the early Holocene (e.g. Le Roy, 2012), thereby suggesting a similar pattern as in the Austrian and Swiss Alps where glaciers shaped moraines during the Egesen and Kartell stadials (Ivy-Ochs, 2015). However, precise palaeogeographic and palaeoclimatic reconstructions require additional chronological constraints on Late Glacial and early Holocene glacier variability in the French Alps. The latter application of glacier records is of particular interest, as the lack of biological proxies from the Late Glacial hampers detailed reconstructions of climatic variations in this region. Figure 1Moraines in the upper Drac Blanc catchment. 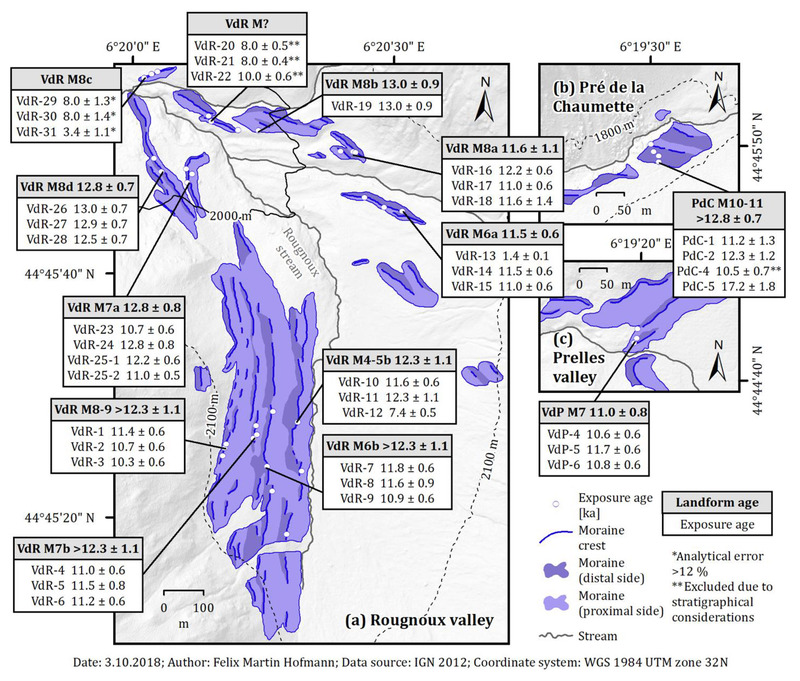 Considering that a sequence of well-preserved moraines in the Rougnoux valley in the southern Écrins massif (Fig. 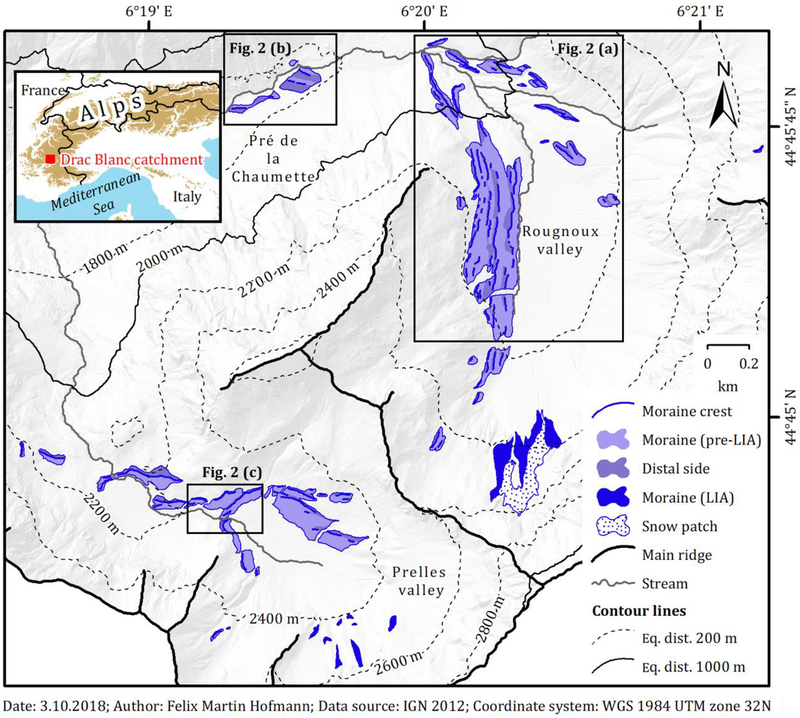 1; Di Costanzo and Hofmann, 2016) has been assigned to glacier fluctuations at the end of the Late Glacial or in the early Holocene, this set of moraines and prominent moraines at two nearby locations (Fig. 1) were considered suitable targets to obtain additional chronological constraints on the related glacier variability. 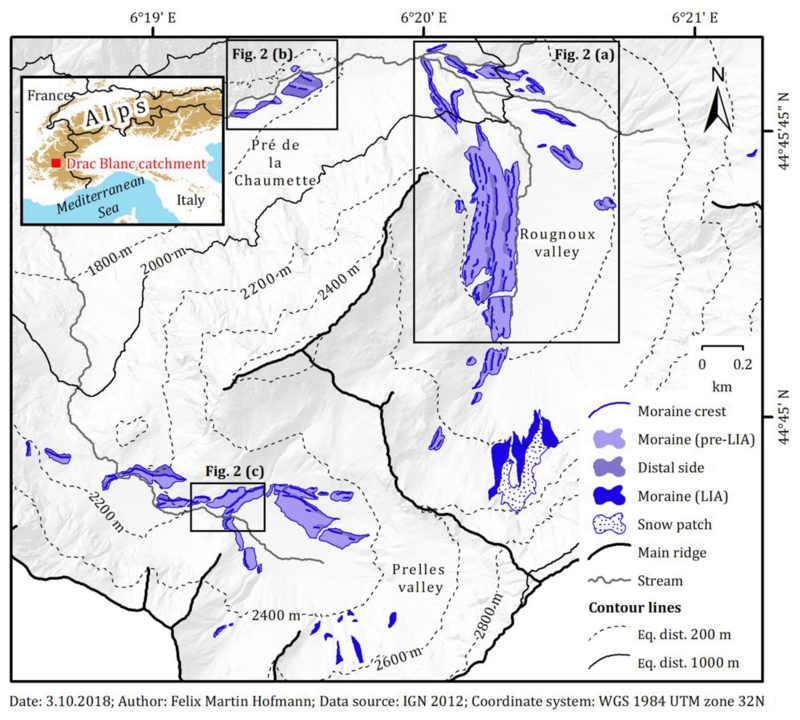 Hence, this study not only contributes to a better understanding of the chronology of Late Glacial and early Holocene glacier fluctuations in the French Alps but also provides a solid base for future palaeogeographic and palaeoclimatic reconstructions. Based on freely available aerial photographs taken by the French National Institute of Geographic and Forest Information (IGN), an orthophoto and a high-resolution digital elevation model (DEM) were established using the structure-from motion technique. The use of a combination of a DEM-based hillshade, the orthophoto and photographs as well as extensive field surveys enabled the establishment of geomorphological maps of the study area using the mapping system of Lausanne University. The identification of pre-Little Ice Age (LIA) moraines in the study area was based on a two-fold approach. Firstly, it was assessed whether the ridges in question are characterised by an asymmetric shape and a steeper proximal side. Secondly, it was verified whether the landforms are composed of a diamicton, if outcrops were available. All moraines, even small ones, which are indicative for the extent of the two palaeoglaciers in the study area, were then assigned to former positions of the glaciers based on their relative position in the field to finally establish a morphostratigraphy. Due to the lack of organic material in the moraines suitable for radiocarbon dating, the measurement of the concentration of the in situ accumulated cosmogenic nuclide 10Be in the quartz fraction of samples from boulders on selected moraines was deemed the only solution to overcome this limitation and to be able to constrain their ages. The 10Be production rate of Young et al. (2013) was chosen for the determination of the CRE ages. Considering that the CRE ages with a snow shielding correction are believed to be most realistic, they are presented below. Given that, in most cases, three CRE ages were obtained from each moraine, landform ages were computed (Fig. 2). First, reduced χ2 statistics was applied. If reduced χ2 turned out to be roughly 1, the average CRE age was chosen as landform age to eliminate the scatter due to analytical uncertainties, whereas the oldest CRE age from a moraine was considered the landform age if reduced χ2 was significantly larger than 1, as most sampled boulders were small, thereby increasing the likelihood for post-depositional exhumation. The computed CRE ages were compared with previously published 10Be CRE ages from boulders on moraines at key sites in the Alps, recalculated according to a recent 10Be production rate (Young et al., 2013), and data from palaeoclimatic proxies other than glaciers. 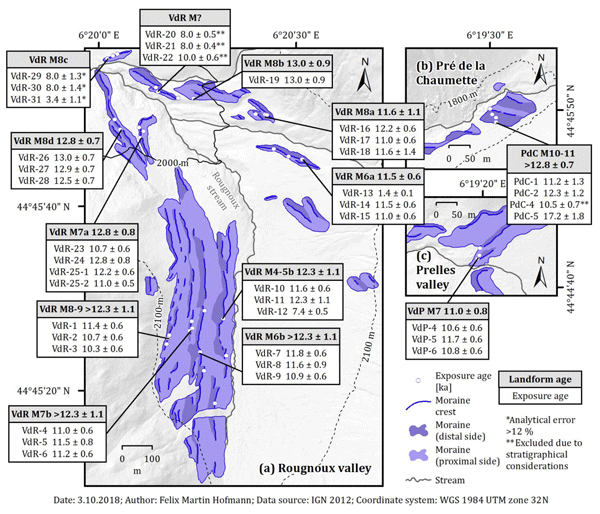 Figure 210Be CRE ages from boulders on moraines in the (a) Rougnoux valley, (b) at Pré de la Chaumette and in the (c) Prelles valley. See Fig. 1 for the location. Thirdly, DEMs of the palaeoglaciers during the deposition of their outermost LIA moraines and the further down-valley moraines were established using the GlaRe ArcGIS toolbox (Pellitero et al., 2016). Generally, the basal shear stress as primary input of the GlaRe toolbox was adjusted to fit the DEMs of the palaeoglaciers to the preserved moraines. 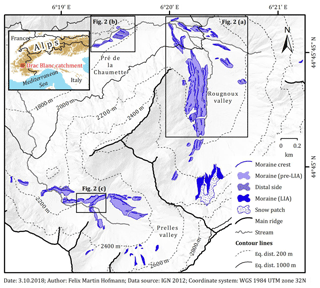 A second ArcGIS toolbox enabled the equilibrium line altitudes (ELAs) of the palaeoglaciers to be determined, whereby the most common accumulation area ratio of 0.67 was assumed. This ratio is believed to be appropriate for Alpine glaciers being in equilibrium with the climate (Gross et al., 1977). Lastly, ELA depressions with respect to the end of the LIA were computed to allow for stratigraphical correlations between sampled and not-sampled moraines. In total, 10 and 8 pre-LIA positions of the Rougnoux and Prelles palaeoglaciers were identified, respectively. An enigmatic 10Be CRE age of a boulder on the lowermost sampled moraine (PdC M10-11) indicates that it may have stabilised after a period of stable ice margins at or before 17.2±1.8kab2k (Fig. 2). Given its location at the confluence of two valleys, the moraine was probably deposited at the common margin of the glaciers from both valleys. During this potential event, the ELA of the palaeoglacier from the Rougnoux valley was depressed by about 210m relative to the LIA ELA, whereas the ELA of the formerly confluent two glaciers from the northern valley must have been situated at a 500–600m lower elevation relative to the LIA. The moraine was certainly reached, or alternatively re-occupied, by the glacier from the Rougnoux valley slightly at around 12.8±0.7kab2k when the ELA was 220m lower than at the end of the LIA. It can be excluded that the palaeoglaciers from the northern valley reached the frontal moraine during this event, since the required ELA depression of the order of 500–600m to trigger a re-advance of both glaciers up to the moraine can be considered unrealistically high for a glacial re-advance at around 12.8±0.7kab2k. Considering that the required ELA lowering (ca. 200m) for an advance of the Prelles palaeoglacier up to its lowermost pre-LIA moraine matches well the ELA depression during the deposition of the latter moraine, both landforms can probably be correlated. The 10Be CRE ages from the Rougnoux valley (Fig. 2) provide evidence for multiple periods of stable ice margins at the end of the Late Glacial and potentially in the earliest Holocene (Fig. 2). These events were associated with ELA depressions between 220 and 160m. One of the youngest periods of stable ice margins in the Prelles valley that was associated with an ELA depression of 150m relative to the LIA occurred at or before 11.0±0.8kab2k (Fig. 1). Considering that the inferred age of the event during which the lowermost moraine was last reached by a glacier matches the cooling at around 12.7kab2k registered in regional and hemispheric palaeoclimatic archives, it can be inferred that the PdC M10-11 moraine and the outermost arcuate pre-LIA moraine in the Prelles valley were deposited during a glacial re-advance concomitant with this climatic downturn. The new 10Be CRE ages agree well with previously published 10Be CRE ages from moraines at different sites in the Central and Eastern Alps that have been assigned to the Egesen and Kartell stadials (e.g. Moran et al., 2016), thereby reinforcing the hypothesis of a common climatic forcing of the corresponding glacier fluctuations. Uncertainties associated with CRE dating as well as an asynchronous response of the palaeoglaciers to the same climatic signal due to local factors, such as topography, are invoked as explanations for the slight variations in the 10Be CRE ages. Overall, this study improves the knowledge about the chronology of Late Glacial and early Holocene glacier fluctuations in the Écrins massif, as the youngest periods of stable ice margins have been dated for the first time. This study highlights that a holistic approach relying on converging lines of evidence, such as geomorphological mapping, CRE dating and ELA reconstructions, should be applied to decipher the glacial history of a region with the greatest possible accuracy. Details on the samples for 10Be CRE dating can be found in a global database of glacial 10Be and 26Al data available at http://expage.github.io/data/txt/Hofmann-2018.txt (last access: 16 November 2018). All other data are available from the author upon request. This study was mostly undertaken during the master thesis project of FMH. PS carried out geomorphological field mapping and supported FMH together with HA during the establishment of the geomorphological maps. The samples for 10Be CRE dating were taken by FMH and PS. The preparation of the rock samples for 10Be CRE dating in the Laboratoire Nationale des Nucléides Cosmogéniques in Aix-en-Provence (France) was performed by FMH. HA and PS provided FMH support during the interpretation of the results of CRE dating and the ELA reconstructions. The manuscript was written by FMH. Firstly, Helena Alexanderson and Philippe Schoeneich are thanked for their excellent supervision. The project was financially supported by the German Academic Exchange Service (DAAD) through a one-year scholarship for graduate students to Felix Martin Hofmann. The administration of the Écrins national park is acknowledged for the authorisation for sampling (authorisation no. 472/2017). Sébastien Bolbenes and Melaine Le Roy are thanked for their dedication during field work. Jordan R. Mertes is acknowledged for his help during the establishment of the DEM and the orthophoto. This study would have been impossible without the unanimous support of Didier L. Bourlès, Laëtitia Léanni, Régis Braucher and Valéry Guillou during the lab work. This paper benefitted from insightful discussions with Lena Håkansson, Per Möller, Melaine Le Roy, Irene Schimmelpfennig, Max Boxleitner, Sven Lukas, Susan Ivy-Ochs and Jürgen M. Reitner and other colleagues. The comments of the reviewers are gratefully appreciated. 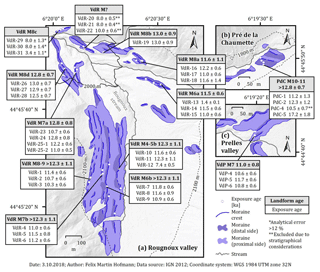 Chenet, M., Brunstein, D., Jomelli, V., Roussel, E., Rinterknecht, V., Mokadem, F., Biette, M., Robert, V., Léanni, L., and ASTER Team: 10Be cosmic-ray exposure dating of moraines and rock avalanches in the Upper Romanche valley (French Alps): Evidence of two glacial advances during the Late Glacial/Holocene transition, Quaternary Sci. Rev., 148, 209–221, https://doi.org/10.1016/j.quascirev.2016.07.025, 2016. Di Costanzo, H. and Hofmann, F. M.: Le retrait du glacier du Drac Blanc (massif des Écrins, Alpes françaises), Méditerranée, Revue géographique des pays méditerranéens, Paléo-environnements, géoarchéologie, géohistoire, 5, https://doi.org/10.15496/publikation-13788, 2016. Gross, G., Kerschner, H., and Patzelt, G.: Methodische Untersuchungen über die Schneegrenze in alpinen Gletschergebieten, Zeitschrift für Gletscherkunde und Glazialgeologie, 12, 223–251, 1977. Heiri, O., Koinig, K. A., Sp.tl, C., Barrett, S., Brauer, A., Drescher-Schneider, R., Gaar, D., Ivy-Ochs, S., Kerschner, H., Luetscher, M., Moran, A., Nicolussi, K., Preusser, F., Schmidt, R., Schoeneich, P., Schwörer, C., Sprafke, T., Terhorst, B., and Tinner, W.: Palaeoclimate records 60–8 ka in the Austrian and Swiss Alps and their forelands, Quaternary Sci. Rev., 106, 186–205, https://doi.org/10.1016/j.quascirev.2014.05.021, 2014. Le Roy, M.: Reconstitution des fluctuations glaciaires holocènes dans les Alpes occidentales – Apports de la dendrochronologie et de la datation par isotopes cosmogéniques produits in situ, PhD thesis, Grenoble University, Grenoble, 363 pp., 2012. Moran, A. P., Ivy-Ochs, S., Schuh, M., Christl, M., and Kerschner, H.: Evidence of central Alpine glacier advances during the Younger Dryas–early Holocene transition period, Boreas, 45, 398–410, https://doi.org/10.1111/bor.12170, 2016. Young, N. E., Schaefer, J. M., Briner, J. P., and Goehring, B. M.: A 10Be production-rate calibration for the Arctic, J. Quaternary Sci., 28, 515–526, https://doi.org/10.1002/jqs.2642, 2013.